Part of Exhibit 422: Monsanto's 1969 "Pollution Abatement Plan." It reads, "The problem involves the entire United States, Canada, and sections of Europe especially the United Kingdom and Sweden. As the investigation broadens other areas of Europe, Asia and Latin America will surely become involved. Evidence of contamination have been found in some of the very remote parts of the world. The involvement could and most likely will follow the DDT [pesticide] investigations." From Sierra magazine, cover story, Sept./Oct. 1994. This article is a synopsis of the fifty-year history of PCBs and dioxins. It is the first ever report of its kind, though in part based on my earlier work in the Las Vegas Sun. It has appeared in different forms in other publications as well. IN THE BLACKNESS of a freezing morning in December 1991, a driver lost control of her car on an isolated road in upstate New York and slammed into an electric-utility pole. Two miles away, the electrical system at the state-university campus at New Paltz went haywire. Minutes later, a Westinghouse electrical transformer cooled with supposedly non-flammable polychlorinated biphenyls (PCBs) exploded and burned, pouring deadly white smoke through Gage Residence Hall. Volunteer firefighters, thinking they were handling a routine electrical fire, searched the dorm for students - all of whom, fortunately, were away on winter break. The chain reaction continued. Within minutes, PCB transformer explosions, ruptures, and fires rocked six campus buildings, including four residence halls that normally house 1,000 students. Polychlorinated biphenyls and their even-more-toxic by-products, dioxins and dibenzofurans, poured through the buildings and spilled outside, contaminating groundwater, storm sewers, utility manholes, lawns, and roads at levels up to a million times the state's legal limit. Decontamination crews wearing respirators and moonsuits soon swarmed over the campus, filling thousands of 55-gallon drums with toxic waste. Within weeks, 560 students were returned to two of the dormitories. Now, nearly three years and $35 million later, decontamination work is still not complete, underground toxic plumes continue to spread, and thousands of students living and studying in contaminated buildings continue to be exposed to dangerous chemicals. Some have filed class-action lawsuits against the state, alleging that the campus was reopened prematurely. The New Paltz disaster is often referred to as an "accident," as are similar fires and explosions in San Francisco, Santa Fe, Chicago, Shreveport, and many other cities. It was not, however, a surprise to the country's largest manufacturer of products that use PCBs. A 1974 General Electric in-house memo reveals that both GE and Westinghouse were secretly aware of the possibility of transformer explosions ten years before the EPA issued warnings about it. "As you know," GE engineer T. L. Mayes cautioned his colleagues, "Westinghouse had a network transformer explosion recently, resulting in two fatalities." Mayes also mentioned that some grades of PCBs apparently create an explosive gas when transformers malfunction - a danger the company concealed from its customers. Neither were customers informed that when burned (as in an explosion), PCBs create dioxins and dibenzofurans - although the manufacturers knew this by 1970 at the latest. In fact, PCBs were aggressively marketed as safety products; the manufacturers even convinced insurance companies to require their customers to use PCB transformers. Across the country, utilities, workers, and consumers are suing those who profited from PCBs for their failure to warn them of the chemical's fatal hazards. The million pages of internal memos, correspondence, lab reports, and private studies made public through these lawsuits show that three of the largest corporations in the United States have known since the 1930s about many of the horrible health effects associated with PCBs - and yet concealed this information from the government, the media, the public, and their own customers. Moreover, Monsanto (the source of all PCBs in the United States), Westinghouse, and GE publicly denied those problems. Monsanto even went so far as to falsify cancer research and use the fudged results to delay the federal regulation of PCBs, which did not occur until 1976. While the companies stonewalled, thousands of workers were exposed to high levels of PCB contamination, and are now dying of cancer at a higher-than-average rate. Millions of pounds of PCBs were used around the country in everything from electrical transformers to french-fry cookers, yet for decades the companies did little or nothing to warn the public of the danger. On the contrary, great effort was spent covering it up. While an internal Monsanto "Pollution Abatement Plan" in 1969 admitted that "the evidence proving the persistence of these compounds and their universal presence as residues in the environment is beyond questioning," it warned that "the corporate image of Monsanto as a responsible member of the business world genuinely concerned with the welfare of our environment will be adversely affected with increased publicity." More to the point, "direct lawsuits are possible" because "all customers using these products have not been officially notified about known effects nor [do] our labels carry this information." Now that such lawsuits are being filed across the country, we are getting our first glimpse of what happens behind the scenes when a poison is too profitable to give up. Peter Montague of the Environmental Research Foundation describes the invention of PCBs as an outgrowth of this century's infatuation with the automobile. "As gasoline was extracted from crude oil," he writes in Rachel's Health and Environment Weekly, "great quantities of other chemicals, like benzene, were left over. Chemists started playing around with these chemicals, to see if something useful could be made." Heating and pressurizing chlorine and benzene under the right conditions, they found, yielded PCBs, a range of compounds (209 in all) that generally take the form of a heavy, syrupy liquid. Because PCBs are stable, conduct heat but not electricity, and are not water-soluble, they proved extremely useful, most prominently as insulation fluid in electrical transformers and capacitors. They have also been made into plastics and mixed with adhesives, inks, paper, paints, and fabric dyes, with many more tons employed as hydraulic liquids, heat-transfer fluids, and lubricating oil in everything from natural-gas pipelines to food-packing plants. They were once the heating medium of choice in the coils of industrial deep fryers for fish and potato chips, and were even mixed with pesticides and sprayed directly onto crops. When Congress regulated the manufacture of PCBs in 1976, it merely closed the lid on Pandora's box. The evil is still loose in the world: up to two-thirds of all PCBs ever manufactured remain in use, and much of the rest has escaped into the environment. Since PCBs are fat-soluble, they bio-accumulate as one species eats another, passing up the food chain in magnified form. These poisons are now ubiquitous, and are especially concentrated in the flesh of predators. Potentially dangerous levels of PCBs can be found in the fatty tissues of seals, whales, eagles, many fish, and virtually every human on earth. The latter effect is now held to be the chemical's most serious danger, because PCBs mimic natural hormones such as estrogen and can severely disrupt the body's endocrine system, resulting in birth defects and sterility. (Among other species, raptors and large marine mammals are particularly vulnerable to the hormonal effects of PCBs, which have been linked to catastrophic crashes in their populations.) Some 42 varieties have been identified in human fat, and the 65 varieties polluting breast milk are passed on to nursing infants at crucial stages of their development, causing learning disorders and disrupting the child's developing immune system. Scientific knowledge about the dangers of PCBs has advanced along two tracks, one private and one public. The secret studies began in 1936 when many workers at the Halowax Corporation in New York City exposed to PCBs (then called chlorinated diphenyls) and related chemicals called chlorinated napthalenes started coming down with chloracne, a painful, disfiguring skin disease. Three workers died. Autopsies of two revealed severe liver damage. Halowax asked Harvard University researcher Cecil K. Drinker to investigate. Drinker presented his results at a 1937 meeting at Harvard attended by Monsanto, GE, Halowax, the U.S. Public Health Service, and state health officials from Massachusetts and Connecticut. Like the Halowax workers, Drinker's test rats had suffered severe liver damage. "These experiments leave no doubt as to the possibility of systemic effects from the chlorinated napthalenes and chlorinated diphenyls," he concluded. Minutes of a discussion held later that day include a telling remark by GE official F. R. Kaimer: "We had 50 other men in very bad condition as far as the acne was concerned," he told the group. "The first reaction that several of our executives had was to throw [the PCB] out - get it out of our plant. But that was easily said but not so easily done. We might just as well have thrown our business to the four winds and said, 'We'll close up', because there was no substitute and there is none today in spite of all the efforts we have made through our own research laboratories to find one." Sanford Brown, the president of Halowax, concluded the meeting with another thought that would echo through the next five decades. Brown stressed the "necessity of not creating mob hysteria on the part of workmen in the plants" where chemical-safety inspections were being made. Problems with PCBs and napthalenes, he predicted, "may continue, probably will continue for years." The silence of those at the meeting ensured that effect. Meanwhile, the damning evidence continued to spill out of corporate laboratories. A 1938 study of PCB-oil mixtures manufactured by Westinghouse and GE demonstrated that liver damage could be caused by skin contact alone, and called for the "greatest personal hygiene" in minimizing exposure. In further research for Monsanto, Drinker warned that adequate ventilation was necessary when handling the chemicals. By 1951, Monsanto also had in its files a 1947 scientific finding that there was "need to give warning" about PCBs because "the toxicity of those compounds has been repeatedly demonstrated." Yet this "need to give warning" was ignored. A 1950 GE instruction manual for PCB transformers assured utilities that "transformer Pyranol [GE's trade name for PCBs] may be handled in the same manner as mineral oil." Even though by 1956 GE's own files contained a bibliography of 43 references on the health dangers and possible lethality of PCBs and PCB component chemicals, the company seems never to have retracted this statement. Monsanto also knew by 1956 that PCB products could be contaminated with dioxins and dibenzofurans from the time they were shipped from the factory -- a piece of information it sat on until the late 1960s, when independent researchers discovered this hazard. According to the record of one lawsuit, new PCB oil can be contaminated with dibenzofurans at concentrations of up to 10 parts per million. As the oil ages, according to documents from Monsanto's files, the concentration becomes considerably higher. The company knew in 1965 that dioxin "can be a potent carcinogen." It is curious, in this light, that Monsanto's R. E. Keller should have noted in an October 20, 1970, internal memo that specially prepared PCB samples sent to a lab for animal toxicity testing were free of troublesome dibenzofurans "which might bias the results." As an aside, he added that they were free from dioxin contamination as well. According to attorney Paul Merrell, "The implication is that the PCBs they tested did not contain the toxic material, but that it was common in their product. It's evidence of a cover-up." Merrell is an attorney in a far-reaching lawsuit challenging the informed silence of the PCB manufacturers. His client, the Nevada Power Company, is charging GE, Westinghouse, and Monsanto in federal district court with fraud and deliberate failure to warn the utility and its customers about product defects and negative health effects associated with PCBs. The companies' initial defense was to argue that the utility was aware of the dangers long before it filed its suit in 1988 and should have suspected fraud earlier, but that the statute of limitations had now passed. "Nevada Power actually knew of the product defects and of facts contrary to those represented" by the PCB manufacturers at the time of sale, argued Monsanto attorney Bruce Featherstone in 1991. "They had actual knowledge of the facts constituting a fraud." In more-recent pleadings, the manufacturers have taken an alternative tack, denying that they committed fraud or failed to warn their customers, and maintaining - numerous scientific studies to the contrary - that their products pose no genuine threat to human health. "Monsanto's actions involving PCBs have always been responsible," spokesperson Diane Herndon wrote in a 1993 statement. According to GE's Jack Batty, "Public perception about the health risks of PCBs and the scientific facts are in conflict. Most scientists agree that PCBs are not the hazard to human health that was feared in the 1970s." [Actually, the EPA's reassessment found them to be a greater hazard than was feared then.] "PCBs have produced tumors in some laboratory animals, but there is no proof - based on human exposure of more than 40 years - that PCBs cause cancer or any other serious health problems in people." Substitute "cigarettes" for "PCBs," and it could be the tobacco industry talking. FOR THREE DECADES, the PCB problem remained invisible to the public -- and indeed to everyone except the top managers of the companies that produced and used the chemical. That changed suddenly in 1966 with the accidental discovery of global PCB pollution by Swedish chemist Soren Jensen. In 1964 Jensen was trying to study DDT levels in human blood when a mysterious group of chemical compounds kept recurring in his samples, interfering with his analyses. The chemical was so pervasive that his first task was to determine whether it was natural or synthetic. Finally concluding that it was some sort of artificial pollutant, Jensen set to work to find out what it was. A two-year investigation established that the mystery compound was chlorine-based and chemically similar to DDT. Jensen knew it wasn't a pesticide, though, because he found it in wildlife specimens collected in 1935, years before chlorine-based pesticides were in general use. All of Sweden and its adjacent seas were contaminated, he discovered; even hair samples taken from his wife and three children showed traces of the compound, with the highest levels in his nursing infant daughter. The mystery pollutant was everywhere he looked. Eventually, Jensen says, "I was convinced that what I had to deal with were chlorinated biphenyls, but I didn't have the faintest idea where such compounds were used in the society." Searching the literature, Jensen learned of PCBs' industrial uses. A German chemical manufacturer provided Jensen with a sample, which he analyzed and found to match the "peaks," or chemical readings, found in a massively contaminated white-tailed eagle. "The circle was closed," Jensen said. "There was no doubt that the unknown peaks came from the use of polychlorinated biphenyls, which I gave the name PCB." Jensen's discovery, first reported in 1966 in the English journal New Scientist, set in motion the chain of events that Monsanto, GE, and Westinghouse had hoped to avoid. The European press took notice immediately, and other scientists soon began investigating PCBs. Industry also took note: by January 1967, according to Monsanto telephone logs, Shell Oil had called to inform the company of the Swedish press reports, and to ask for PCB samples for its own analytical studies. Widespread PCB contamination of the food chain in the United States was first demonstrated in 1969 by Dr. Robert Riseborough of the University of California at Berkeley, who happened upon it in the course of his research on peregrine falcons. San Francisco Chronicle reporter David Perlman learned about Riseborough's findings; his story, "A Menacing New Pollutant," ran on February 24, 1969, and was picked up by numerous other papers. Monsanto launched its public-relations defense the next day by denying that the chemicals were PCBs. "The Swedish and American scientists . . . imply that polychlorinated biphenyls are 'highly toxic' chemicals," Monsanto said in a statement widely distributed to its customers and the press. "This is simply not true. The source of marine-life residue identified as PCB is not yet known. It will take extensive research, on a worldwide basis, to confirm or deny the initial scientific conclusions." Monsanto, however, had all the information it needed to confirm or deny the claim itself. 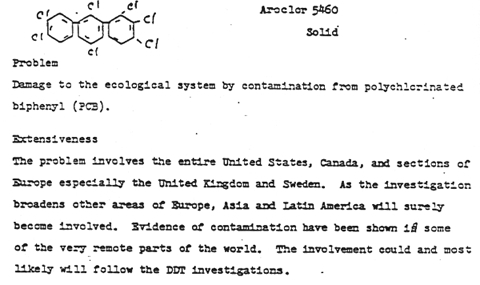 Shortly after Jensen's 1966 discovery, Monsanto executives visited him in Sweden, and company records indicate that Monsanto obtained an unpublished 1968 paper he wrote with two colleagues detailing the analytical method for detecting PCBs in the environment. Neither did Riseborough's findings take the company by surprise: a January 18, 1968, internal memo about PCBs in shorebirds warns a Canadian colleague to "expect publication from California." Riseborough's results were published a year later. There was also plenty of evidence by this time that PCBs were "highly toxic." The first known mass food-poisoning by PCBs occurred in Japan in February 1968, when PCB fluid leaked into a batch of rice-bran oil, or yusho. More than 1,600 people were initially exposed, with many showing immediate symptoms including severe chloracne, respiratory ailments, and failing vision. It was from the "Yusho Incident" that scientists would soon document birth defects, low birth weights, and numerous other chronic effects from PCB exposure. Nine years after the Yusho Incident, there was a sixfold increase in liver-cancer deaths among affected men and threefold among women. Despite international attention to the Yusho Incident, just two months later Monsanto's corporate-development committee set a four-year goal of increasing by 20 times its sales of Therminol heat-transfer fluid - essentially the same PCB product that poisoned the Japanese victims. In the United States, Therminol was used as a heating medium inside the coils of deep-fat fryers. In 1969, while publicly denying the problems linked to PCBs, Monsanto privately acknowledged them in its internal "Pollution Abatement Plan," which admitted that "the problem involves the entire United States, Canada and sections of Europe, especially the United Kingdom and Sweden.... [O]ther areas of Europe, Asia and Latin America will surely become involved. Evidence of contamination [has] been shown in some of the very remote parts of the world." The Pollution Abatement Plan (really more of a liability abatement plan) proposed three options, with charts showing their potential profits and liabilities. Should Monsanto "Do Nothing," profits would likely decline and liability extend into the future. "We cannot deny the findings and the accusations of various agencies," the plan said. "If we took no action we would likely face numerous suits." Under the "Discontinue Manufacture of PCB" option, profits would cease and liability would soar because "we would be admitting guilt by our actions." But with the "Responsible Approach," which involved acknowledging certain aspects of the problem, tightening restrictions, and continuing to manufacture and sell PCBs, profits theoretically would increase and liability slowly decline, all but vanishing by the mid-1970s. It was this latter approach that Monsanto chose, making some adjustments to its business practices but going to battle with the government to keep PCBs on the market, despite growing scientific evidence that they constituted a public-health menace and an environmental nightmare. Henceforth, Monsanto required its customers to sign indemnity agreements to hold it harmless from any future liability. Monsanto also vowed to sell PCBs only to customers who would use them in "totally enclosed systems" - even as it continued to market PCBs in products that directly contacted food. On March 30, 1970, Monsanto physician Emmett Kelly revealed to W. B. Papageorge (who would eventually take on the role of Monsanto's PCB czar) that tons of cattle feed from several Ohio silos had been contaminated by leaching and flaking paint based on the company's Aroclor 1254 PCB-oil. As a result, the milk from three herds was tainted. Kelly estimated that up to 50 other silos in the state were painted with the same PCB-based formulation. "All in all, this could be quite a serious problem, having legal and publicity overtones," the Monsanto doctor warned. "This brings us to a very serious point. When are we going to tell our customers not to use any Aroclor in any paint formulation that contacts food, feed, or water for animals or humans? I think it is very important that this be done.... I think we should make a blanket recommendation against these uses." Despite years of discovery in lawsuits, the manufacturers have not produced any evidence that such a warning was issued. Between July 1969 and August 1971, at least nine major PCB contaminations of food occurred. Shredded wheat contaminated by packaging material was shipped all over the country; in upstate New York, Campbell Soup had to destroy 140,000 tainted chickens. Monsanto continued to view the crisis as a public-relations problem. In 1971, Papageorge addressed a special committee of the American National Standards Institute that was searching for ways to extend the use of PCBs. "We cannot overlook the emotions that have set in," he said, "and believe me, there are many and they are deep. As you know, the references in the popular press to hazardous poisons and birth defects, which have not been substantiated, are most difficult to overcome." At Westinghouse, another special committee met to discuss the growing PCB crisis. The December 28, 1971, minutes of the meeting (stamped "PROPRIETARY CLASS 1 -- DESTROY BY BURNING OR SHREDDING") acknowledged the problems of PCB accumulation in wildlife, and indicated that PCBs caused reproductive disorders in chickens and birth defects in victims of the Yusho Incident. They also acknowledged that Yusho might have involved dibenzofurans, which are created when PCB oil is heated. AT THIS POINT, the crisis entered its darkest hour. In order to maintain its 1971 position that "PCBs are not and cannot be classified as highly toxic," Monsanto engaged Industrial Bio-Test Labs of Northbrook, Illinois, to do safety studies on its Aroclor PCB products. Seven years later, IBT Labs would be at the center of one of the most far-reaching scandals in modern science, as thousands of its studies were revealed through EPA and FDA investigations to be fraudulent or grossly inadequate. One of IBT's top executives was Dr. Paul Wright, a Monsanto toxicologist who took a job at IBT Labs in part to supervise the PCB tests, and then returned to Monsanto. Wright was eventually convicted of multiple counts of fraud in one of the longest criminal trials in U. S. history - with his legal fees paid by Monsanto. While fraud on the PCB tests was not raised in the IBT trial, it is strongly suggested by memos and letters that came to light in later civil lawsuits. Several of these show how, at Monsanto's request, IBT Labs customized its studies. "I think we are surprised (and disappointed?) at the apparent toxicity at the levels studied," Monsanto's Elmer Wheeler wrote in March 1970 to IBT president Joseph Calandra. "I doubt that there is any explanation for this but I do think that we might exchange some new thoughts." In a letter to IBT Labs two months later commenting on a set of PCB test results, Wheeler wrote, "We would hope that we might find a higher 'no effect' level with this sample as compared to the previous work." In later years, Monsanto's requests would become even more blatant. "In two instances, the previous conclusion of 'slightly tumorigenic' was changed to 'non-carcinogenic,'" Monsanto wrote in July 1975. "The latter phrase is preferable. May we request that the Aroclor 1254 report be amended to say 'does not appear to be carcinogenic.'" Two weeks later, Calandra responded: "We will amend our statement in the last paragraph on page 2 of the Aroclor 1254 report to read, 'does not appear to be carcinogenic' in place of 'slightly tumorigenic' as requested." Testimony about the IBT Labs scandal in a Texas lawsuit against Monsanto indicates that IBT was aware that PCBs caused extremely high numbers of tumors in test rats, with 82 percent developing tumors when fed Aroclor 1254 at 10 parts per million and 100 percent at 100 parts per million. Yet with a stroke of a pen, IBT Labs certified PCBs a noncarcinogen. Working behind the scenes of such scientific miracles was Paul Wright. In July 1976, after returning to Monsanto, he was given a $1,000 award for "forestalling EPA's promulgation of unrealistic regulations to limit discharges of polychlorinated biphenyls." A year later, IBT Labs was found out, and Wright, Calandra, and another IBT exec were eventually convicted of federal fraud charges. The first proposal for a total ban on PCBs was made by Representative William Fitz Ryan (D-N.Y.) in 1970. But partly due to the IBT tests, the substance stayed on the market until the Toxic Substances Control Act of 1976. Before the lid clamped down, industry continued to minimize reports of PCB toxicity. "The low order of toxicity to man is supported by several decades experience in the U.S. electrical industry," GE wrote the EPA in November 1973, urging the agency not to regulate PCBs. In its comments, Monsanto stated that "PCB has always been considered less hazardous than many other chemicals in everyday use." Denials of the dangers would continue even after the ban. "There has never been a single document case in this country where PCBs have been shown to cause cancer or any other serious human health problems," said Monsanto toxicologist John Craddock in a January 30, 1981, speech. "In the classical short term exposure, or acute toxicity sense, PCBs are classified as 'slightly toxic' by oral ingestion." Their toxicity was similar, he said, to table salt. "Monsanto, the government and the electrical industry together concluded that the benefits to society of continued PCB use far outweighed the risk." Decades after the Drinker study demonstrated PCBs' toxicity, 25 years after Monsanto's files indicated that dioxin and dibenzofurans were contaminants in PCBs, and with a former Monsanto official standing trial for fraud, Monsanto still claimed that PCBs were safe. Six days after Craddock's speech, a PCB transformer from GE filled with Monsanto's Aroclor 1254 exploded and burned in Binghamton, New York - the first such U.S. explosion that was publicly acknowledged to involve PCBs. "Binghamton's tallest building, centerpiece of a modern, multi-million-dollar downtown government complex, is now a landmark of the Chemical Age, an empty monolith filled with deadly dioxins," wrote the Associated Press. "What started out as a routine electrical fire eventually released some of the most toxic chemicals on Earth throughout the interior of the 18-story structure." Thirteen years later, the building is still closed to the public.